Raspberry Rose Marshmallows are the thing homemade marshmallow dreams are made of…soft, gently sweet, beautiful to make and eat. 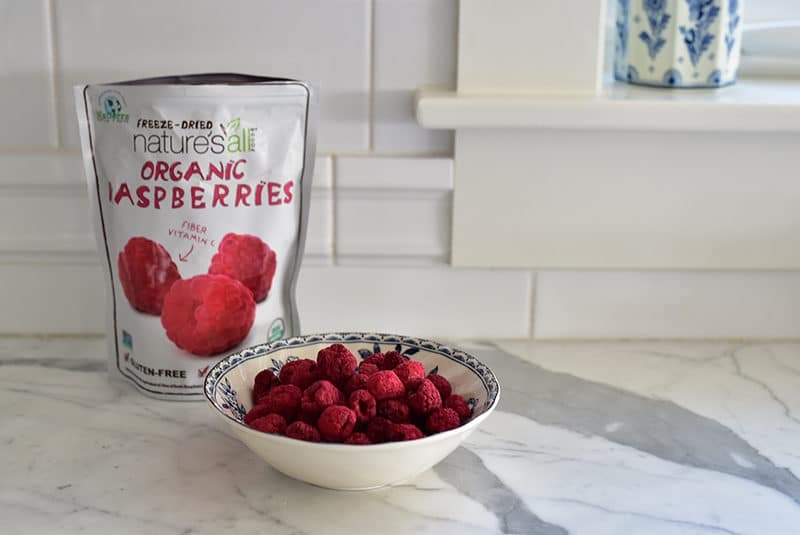 These get layers of flavor with LorAnn Oils raspberry extract and freeze-dried raspberries, a flavor that pairs perfectly with rose water. It is not a secret over here that I was not a great eater when I was a kid. Neither was my sister. There was plenty of good food; I mean, we were eating kibbeh nayeh from the get-go. Still, not hungry. Or at least not at the appointed hour. 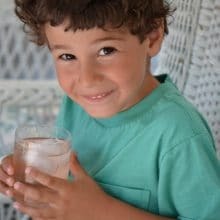 It went so far as a little girl taking her dinner plate, full of dinner, from the kitchen table and hiding it under a chair in the dining room. As though…. At night, not too long after my mom would go through her antics to get us into bed (hoooocus pooooookus, goooooo to sleeeeeeep! ), we like children everywhere found any excuse to get out of bed and come back downstairs. We blessedly didn’t have a mom who’d say you should have eaten your dinner; instead my Mom lifted her little koosa up on the counter and asked, what are you hungry for? Okay, how about a cracker? Okay, how about a pretzel? A cucumber? And so on, until the bag of soft, ethereal, beautifully white jet-puffed marshmallows appeared. No further discussion needed. What I didn’t know then that I do know now, so very well, is that my mom was secretly glad we refused everything but the marshmallows. That meant she could eat marshmallows too. This has to be the root cause of my profound (if profound and marshmallow can go in the same thought) marshmallow devotion, one that has never waned. 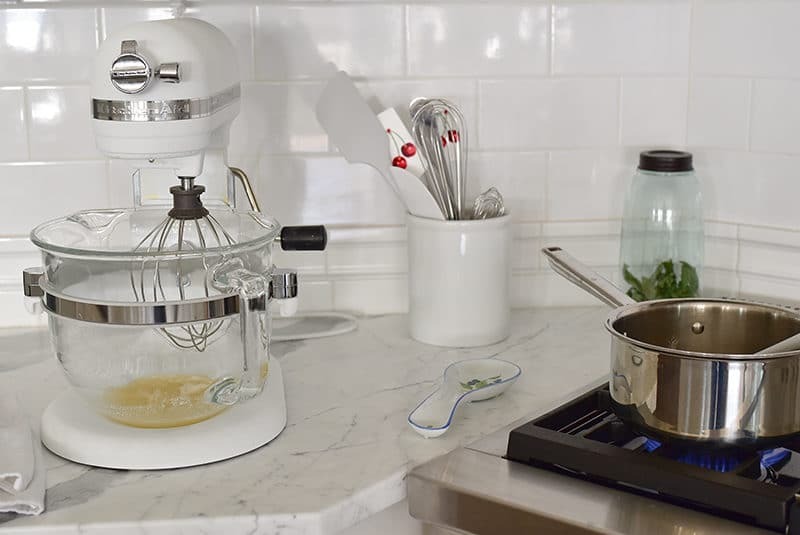 Case in point, the big matte white KitchenAid Mom gave us. Evocative of marshmallow, and easy choice here among the glorious rainbow of mixer colors. On Sunday mornings when I was small, before anyone was awake, I would go into some bizarre marshmallows test-kicthen-y type of activity. I got the idea to warm them up, and see what happens (note that this was long, long before s’mores were anything more than a passing whim some summer or another). I would nuke a paper plate full of them and savor every phase of the experiment. In case you don’t know, in the microwave marshmallows inflate like a balloon. Immediately after, they become silky smooth and pliable (my favorite phase). Then, like anything microwaved, they go from soft to crunchy in an instant. I favored the soft silky ones over the crunchy, but I ate them all. One of my first candy-making adventures was the marshmallow-like divinity (sans nuts, of course). When divinity and I met again in culinary school, I went a little nutty cookoo. I found my way as a girl from divinity to floating islands. All along right up until today (exhibit A, our Showstopper Cake), there was a procession of birthday cakes topped with the marshmallow of all frostings, Betty Crocker’s White Mountain, that my mom made for me every year. Why it took me so long to get to making actual marshmallows, I have no idea. 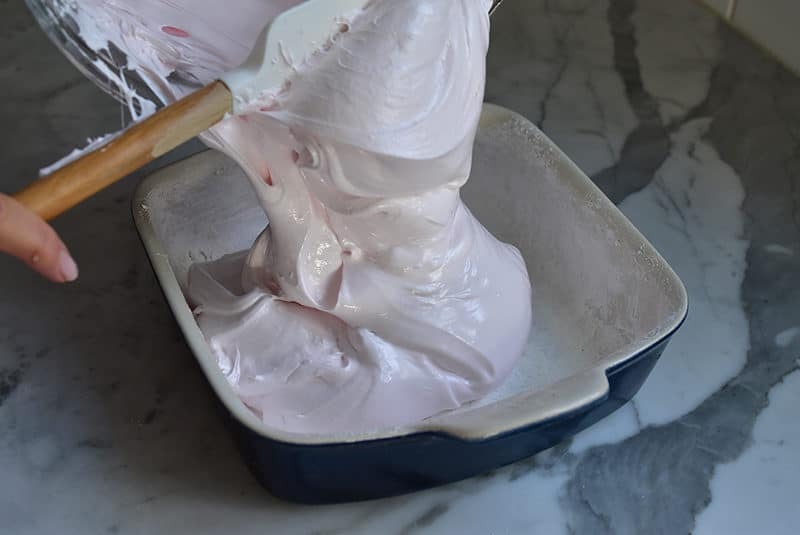 Plain, simple homemade marshmallows are beyond great, so imagine what happens when you add LorAnn raspberry extract (LorAnn is a hometown business here!! 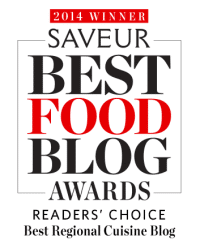 Their flavorings and emulsions are a must-have for bakers and candy-makers the world over). 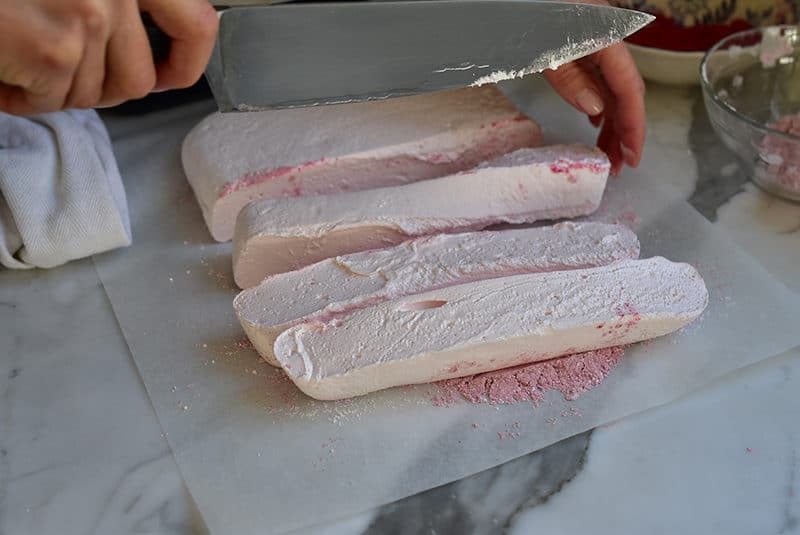 And then the raspberries themselves, freeze-dried so we can ramp up not just the color but fabulous flavor in the non-stick coating dusted on the sides of the cut mallows. At home, these days it seems like we are always asking Mom what she’s hungry for. I think she’d like to hide her plate half the time. But there is always, always room and appetite for marshmallows. When I shared these raspberry rose pretty little babies during recipe testing, people have eaten and said mmm!, yummy. But Mom and me? We think they’re way beyond. We think they sure are something. If you really want to gild the lily with these, eat them drizzled with Soom chocolate tahini. 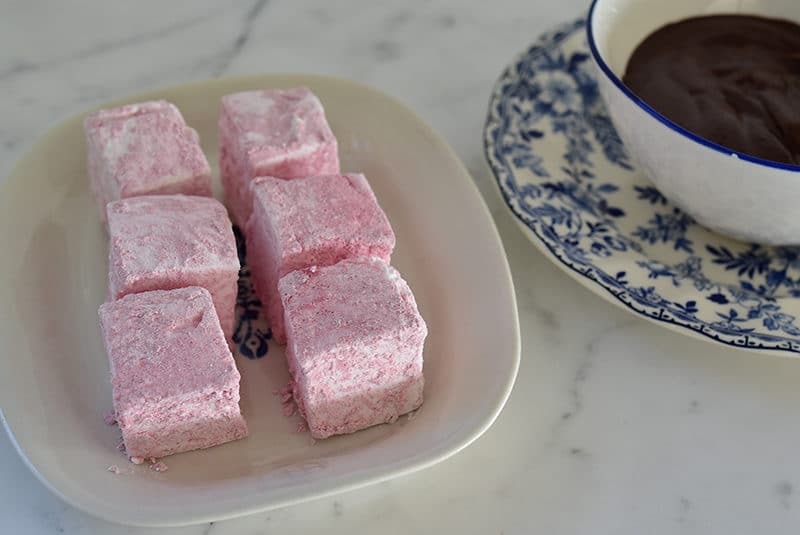 The marshmallows can be made in an 8”x8” or 9”x9” square baking dish or pan. 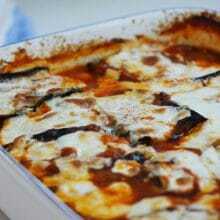 Coat the bottom and sides of the dish liberally with oil. 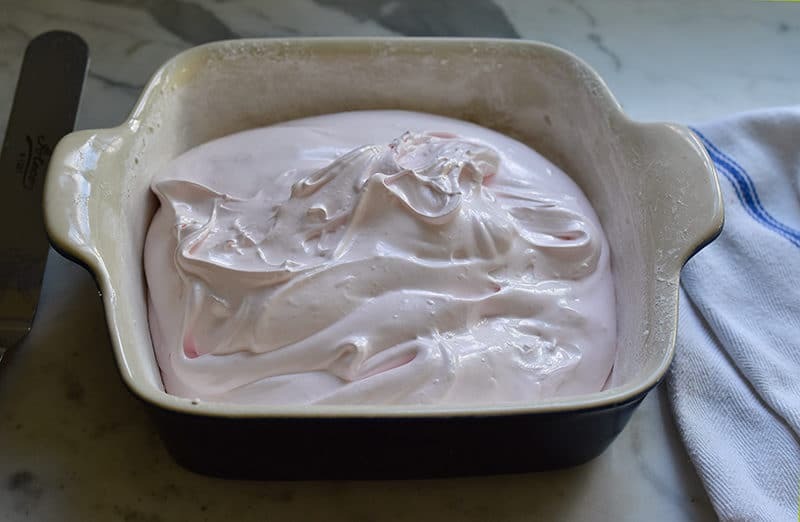 In a small bowl, whisk the confectioners sugar and cornstarch, then liberally coat the oiled dish with this mixture as you would flour a pan. Also coat a rubber spatula and set aside for later. 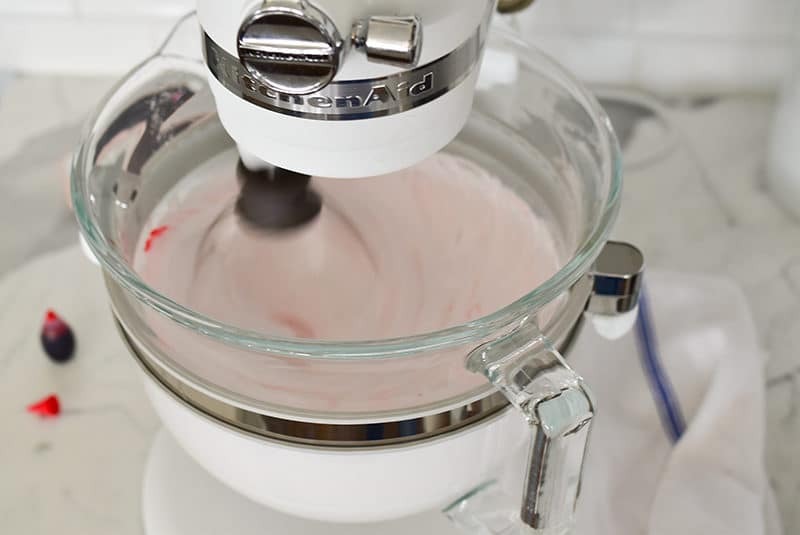 In the bowl of a stand mixer, bloom the gelatin by dissolving it in ½ cup of the water. Slowly sprinkle all of the gelatin over 1/3 cup of water. Set aside. 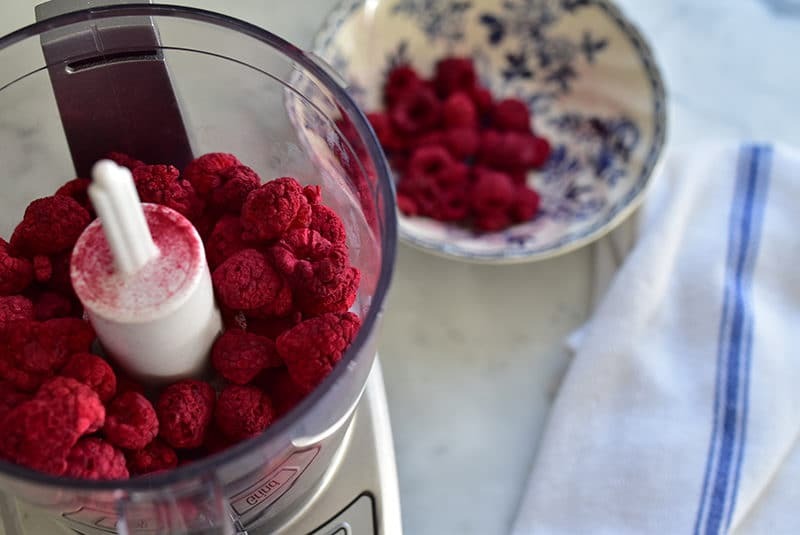 In a small food processor, pulverize the freeze-dried raspberries to a powder. Sift the powder through a fine mesh sieve into a bowl and discard the seeds left behind. 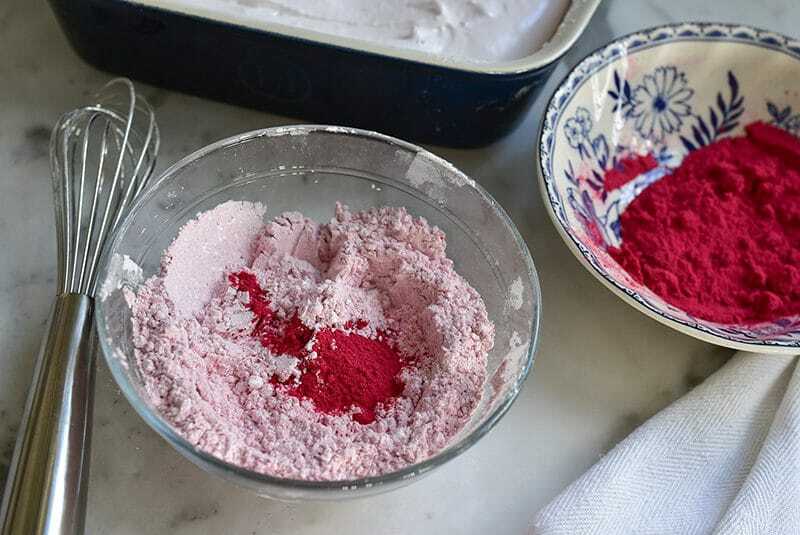 Stir 2-3 tablespoons of the raspberry powder into the remaining confectioners sugar-cornstarch mixture. Set aside. 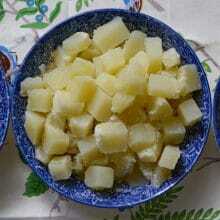 In a small saucepan, combine the sugar, corn syrup, and remaining ¼ cup water over medium high heat. Bring to a boil and continue to boil for about one minute. Begin to whip the gelatin using the whisk attachment on the stand mixer on high speed. Slowly pour the hot syrup into the gelatin along the side of the bowl. Add the salt, raspberry flavoring, rose water, and vanilla. Add pink food coloring a few drops at a time until you get the color you want (I used just a few drops of red to get light pink). 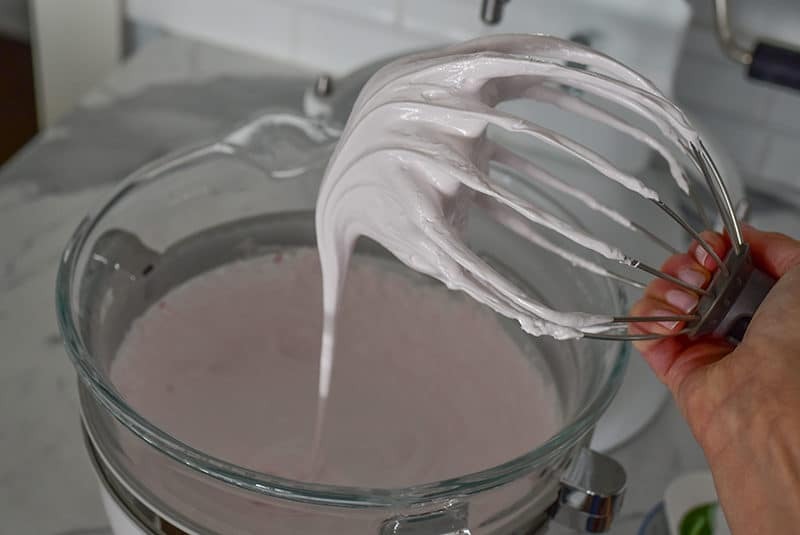 Continue whisking on high, until the marshmallow forms stiff peaks. 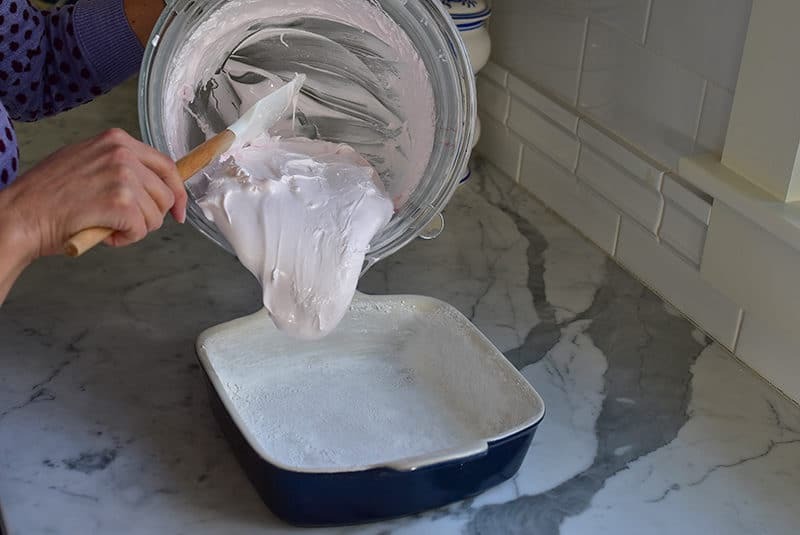 Working quickly, use the oil-coated spatula to scrape the marshmallow into the prepared pan. 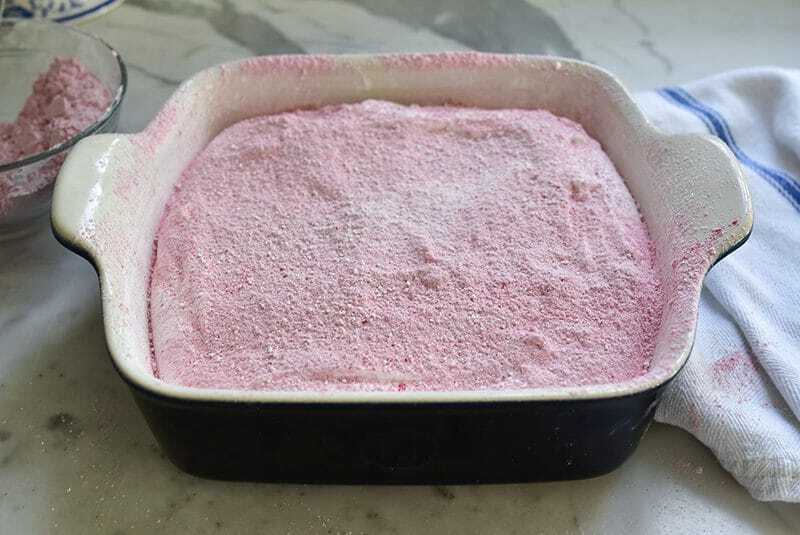 Smooth the top and sift a light layer of raspberry sugar over top. Let the marshmallow set up for at least one hour. 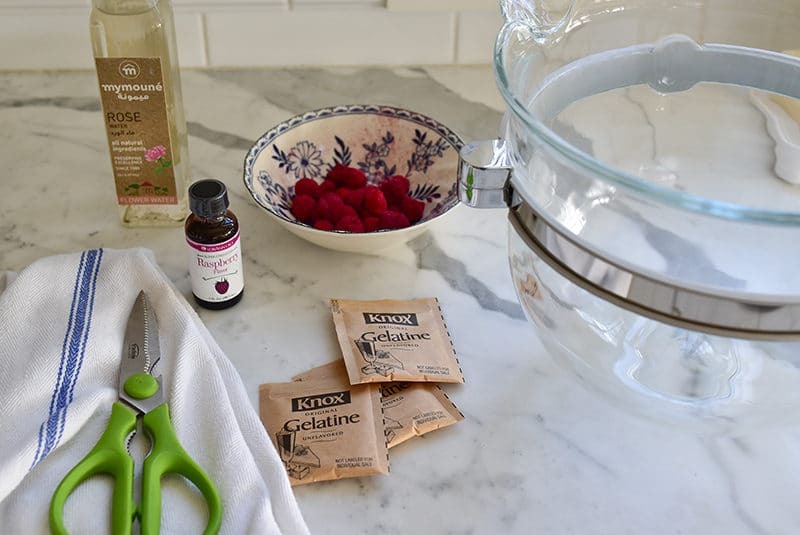 Place a sheet of parchment on a cutting board or work surface. 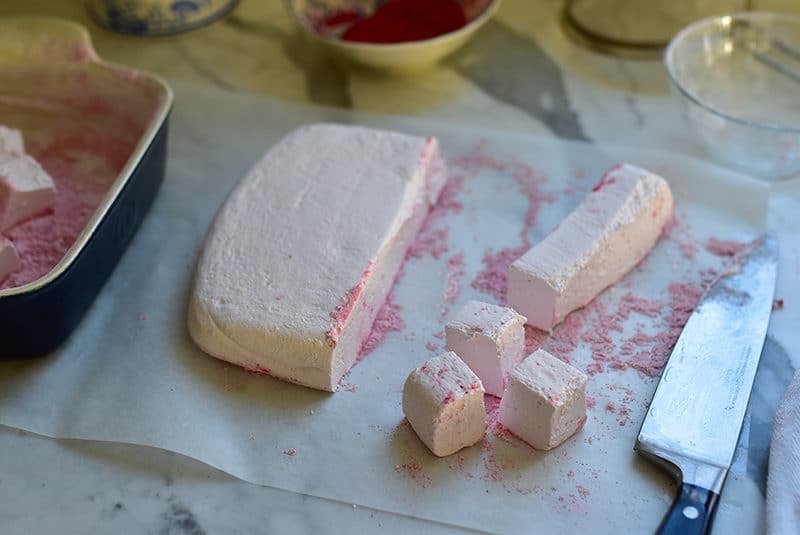 Turn the marshmallow out of the pan onto the parchment, then place the remaining raspberry sugar in the baking pan, to provide a wide surface (with sides) to dust the cut marshmallows. Brush a large, sharp knife with oil and keep a wet paper towel or cloth handy. Cut the marshmallows into squares, wiping and re-oiling the knife frequently. Toss the marshmallows in the raspberry sugar, coating all sides well and knocking off any excess. Eat them up! Store the marshmallows in a Ziploc bag or other airtight container. They’ll keep for a couple of weeks. The coating may hydrate a bit overtime and get a flecked pink look to them. Very pretty! 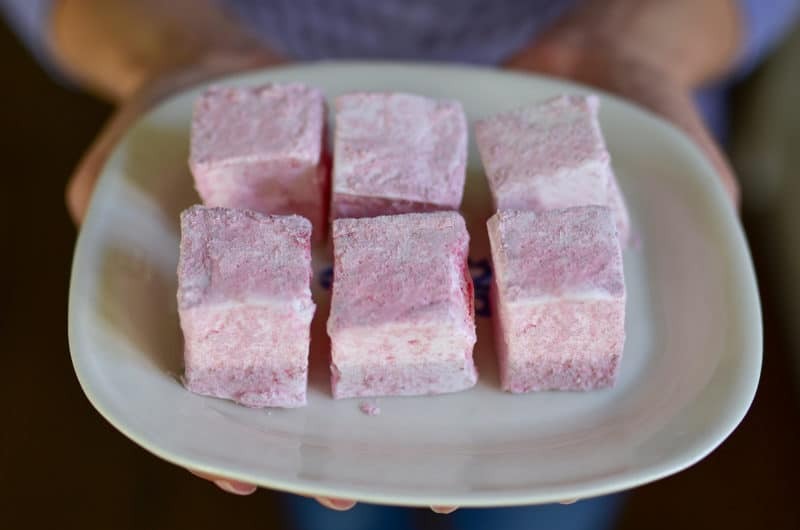 2 Responses to "Raspberry Rose Marshmallows"
Well, Maureen, now I realize who you remind me of so much, in your feisty sweet spirit and your refusal to eat as a child! My daughter, Mary. I thought she would never get the appetite to eat properly! She eats well now and cooks all the Syrian Lebanese foods she grew up with. And, she loves marshmallows! She’ll love this blog! All my girls have your book which I gave each of them at Christmas three years ago. SO special, so beautiful!! Thank you Marlene and give my warmest regards to all of your girls!